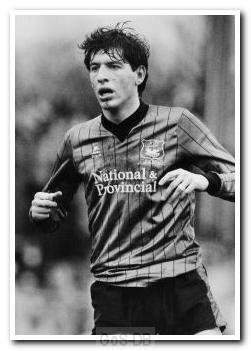 When he signed from Tranmere Rovers in the summer of 1985, Clayton was the Football League's joint 'golden boot' holder after scoring 31 league goals for the Prenton Park side in the previous season, sharing the honour with a certain Tommy Tynan at Argyle. The Elgin-born forward started his career with Derby County before spells with Bulova SA (Hong Kong), Chesterfield and then Tranmere. But he found the step up from the Fourth Division a harder nut to crack, scoring 23 goals in three seasons at Home Park before joining Dutch side Fortuna Sittard. He later played for FC Volendam before returning briefly to English football with Burnley, where injury forced his retirement in 1994. Clayton moved to Bristol after his playing career ended (his wife had a business there) and started assisting Bristol City as a coach at various levels of youth football - his son Jon was also at their academy at the time. He later worked as assistant to Keith Millen with the club's under-17 side, and in October 2006 was appointed as head coach of Bristol City's academy. In a backroom reshuffle in 2012, Clayton was put in charge of the under-18s but in the November of that year he left Ashton Gate to take up a role with the Football League in London. John Clayton was known to Plymouth as far back as 1976. As a sixteen year old prolific goalscorer in the Morayshire and Elgin youth football ranks, and as the Scottish Scout for Plymouth in the 1970s, I sent John down on a one week trial to Plymouth in May 1976 with three other Elgin schoolboys. Plymouth never signed John at that stage and he returned home and signed for his local professional Scottish Highland Football League Club, Elgin City before transferring to Derby County the following season. The other three local boys all ended up playing in the Highland League.